As Alumni Association President, I celebrate John Jay’s amazing past and look forward to our role in its bright future. I am reminded that we don’t just have a large alumni base in terms of sheer numbers – we have a huge group of passionate, loyal and committed community of members. You can play a crucial role in helping us translate our incredible alumni loyalty into increased John Jay’s Alumni Association participation. Our organization exists to unite alumni and magnify their impact at the College. Be it through event participation, contributing to a scholarship, or encouraging family members and associates to choose John Jay College for their academic career, we can collectively make a difference for our alma mater! 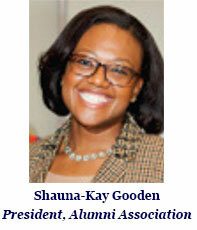 Thank you again for allowing me the opportunity to serve as your Alumni Association President. I’m excited about what the future holds for us as we partner to strengthen and grow our Alumni Association and act as alumni ambassadors for the College we love.